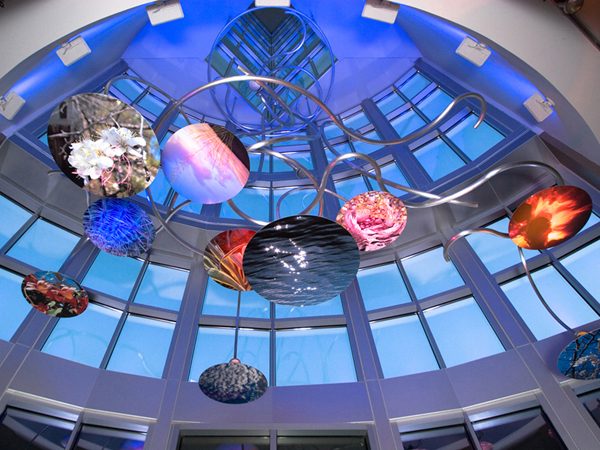 Water Tree is a site specific suspended sculpture for the entryway lobby of a building. The work of art incorporates sculpture, photography, painting, and light into a celebratory experience. Graceful curving lines of metal that reference the movements of flowing water and tree branches begin 30 feet above the floor. 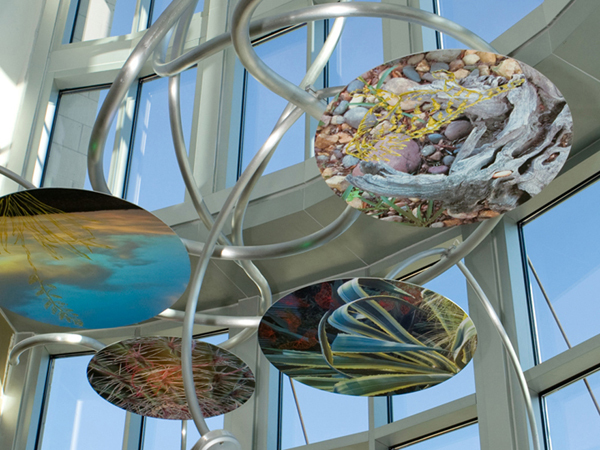 Discs of lightweight metal suspended from the sculpture are emblazoned with photographic images taken from the landscape around Austin. Each photo references one of the elements- Earth, Air, Fire or Water. Painted images of the flora and fauna from the Texas Hill Country are integrated into the photos and illuminated with slowly changing colors. Residents and guests will be treated to a unique and magical experience as areas of the photos advance and recede during the color changes. This is the first large-scale artwork in Austin to use this unique lighting effect.